Description The controversy over human deprivation which raged throughout the eighteenth century was no mere intramural squabble among theologians but an important phase of the evolution in Western man’s estimate of his nature and potentialities. 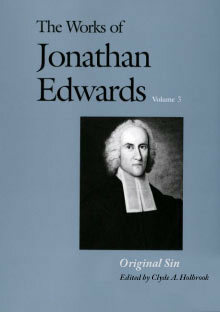 By the time Jonathan Edwards entered the lists to champion the hated doctrine of original sin, he saw himself as not only defending a particular dogma but also combating an increasingly dominant drift of opinion which had already engulfed much of Europe and was encroaching dangerously upon America. First published in 1758, The Great Christian Doctrine of Original Sin Defended went though at least 13 separate editions and was included in all collected editions of Edwards’ works. The text of the first edition has now been brought into accord with the principles of the Yale Edition, making full use of all relevant manuscript materials. Mr. Holbrook’s comprehensive Introduction and annotations provide detailed information about the sources, development, and reception of the work. Clyde A. Holbrook is William H. Danforth Professor of Religion at Oberlin College.